Back in '79, PUNK ROCK had seemingly run it's course but certainly had made a huge impact on the charts. There were still plenty of worthy Punk bands from all over the world (and still are) but, although the Punk scene had kick-started the indie label scene, the major labels tended to avoid all but the most melodic of the Punk breed (The Clash, The Jam, 999, Buzzccocks, The Stranglers, etc.). Slowly but surely, the musicians that were energized by the whole movement began creating a new sound that retained the energy of Punk but added melodic hooks and a clean, commercial polish. This sound was called NEW WAVE and it became one of the biggest musical movements since... well, Punk! The New Wave sound was a lot easier to promote and had a better chance of chart action, so the major labels began snapping up any band capable of writing a catchy hook. One of New Wave's most respected 'sub-categories' was Power Pop. Power Pop was certainly not new, since early '70s bands like Raspberries and Badfinger had achieved great success years earlier but the scene was re-energized when The Knack became the first Power Pop superstars of the New Wave generation. In 1979, their single "My Sharona" and the album Get The Knack became major hits and practically every label started searching the underground New Wave nightclubs for 'the next Knack'. Thankfully, there were plenty of worthy bands to sign including 20/20, The Plimsouls, The Beat (AKA Paul Collins' Beat) and many many others. Even quirky outfits like Jules & The Polar Bears (fronted by Jules Shear) became part of this burgeoning scene. In no time, L.A. became THE place to find the perfect Power Pop band. 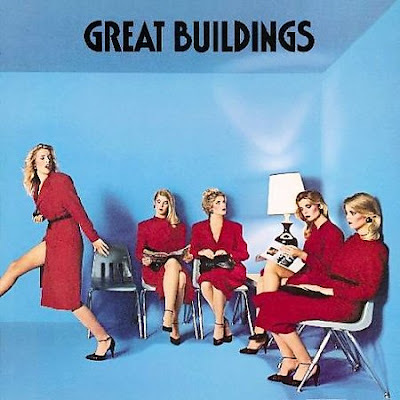 A while after The Quick split, Wilde and Ainsworth joined forces with guitarist Phil Solem and drummer Richard Sandford in a quartet they christened Great Buildings. Though they weren't immediately caught up in the Power Pop scene in '79, within a year, the labels came sniffing around and the band were eventually signed, releasing their debut album, Apart From The Crowd, in 1981. And thanks to Wounded Bird, we get to experience this fab platter in all it's glory... ON CD! Apart From The Crowd is about as perfect as a Power Pop album gets. Hell, it's a perfect Rock album and a perfect New Wave album, too! The melodies are infectious, the production is timeless and the harmonies are heavenly. The album's lead track (and single) "Hold On To Something", should have made these guys stars. It's catchy as sin and the arrangement is flawless. The energy and joy that leaps from the speakers during the song's 3 minutes and 47 seconds makes you want to go back and hear it again. And again. And again! Thankfully, "Hold On To Something" is just the beginning of an exceptional album that definitely has stood the test of time (has it really been 28 years since this gem was released?). "One Way Out", "...And The Light Goes On", "Combat Zone" and "Love Goes Blind" are filled with all the same ingredients and also beg for repeated listenings. In fact, before you know it, 40 minutes after you push play, the album is over and you'll find yourself leaping up to start it all over again! Robert Palmer must have felt this way since he ended up covering the track "Maybe It's You" on his Maybe It's Live release! If you're hip to what Power Pop is all about, then this is essential listening. If you want to know what Power Pop is all about, then this is essential listening. If you just want to hear some great songs to cruise along to, then this is essential listening. If you're not picking up what I'm laying down, then let me spell it out: E-S-S-E-N-T-I-A-L! Solem and Ainsworth eventually left the band, leaving Wilde and Sandford to carry on. They continued using the Great Buildings name for a few years, but the momentum was gone and they quietly split. Sadly, Sandford died a few years later. Danny Wilde later signed a solo deal with Island, recruited Solem into his band and recorded the Great Buildings-like album The Boyfriend. Solem split again and Wilde continued as a solo artist. In 1990, Wilde and Solem reappeared on the music scene as The Rembrandts, scoring a hit with "That's Just The Way It Is Baby" and then, in 1995, hit paydirt with "I'll Be There For You", the theme song from the hit TV show, Friends! Thus ends our lesson for today! There will be a quiz at the end of the week, so don't forget to study!